The isle of Capri is most often visited by day-trippers from Sorrento or Naples, but is sometimes a Cruise Port for small ships. This is usually a tender port. There are three towns on the island. Local open tenders land cruise passengers in Marina Grande, a busy little port also welcoming hydrofoils and ferries from Sorrento and Naples. From there it's an uphill trip (by taxi, funicular or bus) to Capri town and Anacapri. Capri is famous for the beautiful Blue Grotto, which is a stop on most excursions, in addition to the villas built by Emperor Tiberius. Explore the small town squares or take a motor launch for a view of the coast. The Blue Grotto is one of several sea caves, worldwide, that is flooded with a brilliant blue or emerald light. The quality and nature of the color in each cave is determined by the unique lighting conditions in that particular cave. 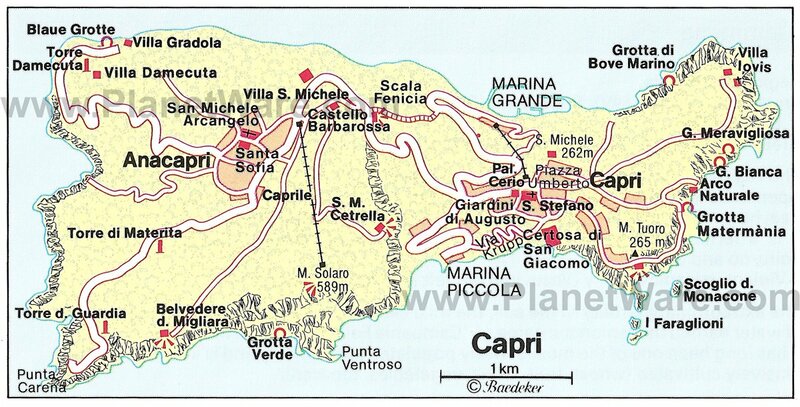 The tourist offices are at Capri:Piazza Umberto I, Marina Grande: Banchina del Porto and Anacapri: Via G. Orlandi, 59. Head to Anacapri and Mount Solaro (1,933 ft.) for views of the island from its highest point. You can go on foot (if you are very fit) or take a chair lift, which has its lower station at Piazza della Vittoria in Anacapri (the ride takes about 12 minutes). A nice way is to take the city bus to Anacapri (1.80 Euro) right from the Marina Grande to Piazza della Vittoria in Anacapri, a spectacular trip in itself, nice views and very narrow roads. Sit or stand on the right side of the vehicle for perfect views. Once on top buy the chair lift ticket (10 euro return) and enjoy the magnificent views on top. There is even free Wifi at the top and a real relaxed atmosphere. Back in Anacapri do take the bus to Capri town and stroll the streets, then take the Funicolare (1.80 euros) back to Marina Grande (The Port). Note: Capri Island can be extremely busy in the summer: So plan this trip before 9.30 am or after 2.30 pm to avoid long lines. Real nice open Capri taxis (not cheap!) are available at the pier. There are also buses (tickets and other information is available at the Ticket Office -- head right as you exit the pier area). Funicular passes are also available at the Ticket Office and the funicular (located to the left of the pier area) is the easy and fun way to get up to Capri town. The steep ride only takes about five minutes (standing in line for tickets can take longer). You are dropped off up top right around the corner from Piazza Umberto I, the main square of Capri town. As another alternative, tour operators offer island tours from booths near the pier and in Capri town. The funicular costs 1,80 Euros. Daily bus ticket which include a two-way funicular trip is 8,40 Euro. One of the best ways to tour Capri is by boat and a wide variety of options are offered from Marina Grande. Capri is best known for "capri" slacks (Jacqueline Kennedy Onassis had hers made there). It's also famous for handmade leather sandals.and Limoncello, a lovely lemon-flavored liqueur made from the lemons of Capri. Totani e Patate (with potatoes): the cuttlefish, similar to the calamari but with a much stronger taste is an important ingredient in the cooking of Capri. It is fished at night in the waters around the island. The island is used to cater to well-filled wallets, so price levels are accordingly. Wifi offered at many sidewalk cafes, but remember that drink prices are very high here, making your cruise line offerings look like a bargain.